Welcome to Weberding's Carving Shop Inc.
William J. Weberding established Weberding's Carving Shop in Batesville, Indiana in 1942. Weberding's Carving Shop is a truly unique business. 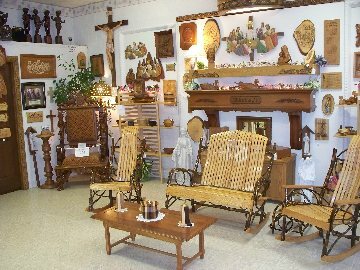 Our business is involved in a variety of projects which include Wood Carving, Custom Made Furniture, Statue Refurbishing, Wood Patterns, and Church Furnishings. We have created many pieces of artwork for a variety of organizations and people, which include many celebrities throughout the United States and the World. We now welcome you to browse through our site and see some of the exquisite pieces of art we have created in the past 75 years of being in business. 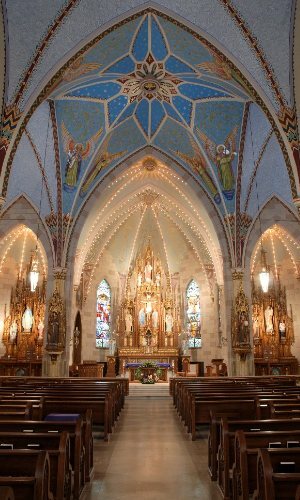 Ten years ago this fall, Weberding's finished installing one of our largest jobs ever at Sacred Heart Church in Indianapolis, Indiana. 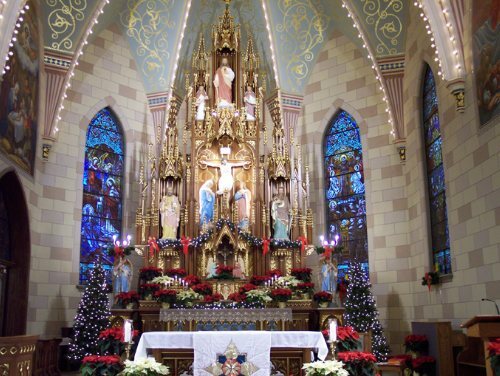 Sacred Heart suffered a horrible church fire on April 27, 2001 that damaged much of the church including the High Altar, Side Altars, Pulpit, & Statues. We were tasked with refurbishing anything that could be saved and reproducing items that were too badly burned to be salvaged. A year and half later Sacred Heart re-opened and the results were amazing. While this job was large for Weberding's it allowed us to showcase our unique talents and bring a beautiful altar back to life. Click the link below to view many more photos of our restoration process. Weberding's Carving Shop was recently fortunate enough to be featured in the Criterion Catholic Newsletter. They wrote a great piece telling the story of the Weberding family, the start and continuation of the business, and the celebration of our 70th anniversary. We are very thankful to the Criterion for this oppurtunity and we hope you enjoy the article! To view the article just click on the logo above. To view the entire newspaper, which include many more pictures click the link below. 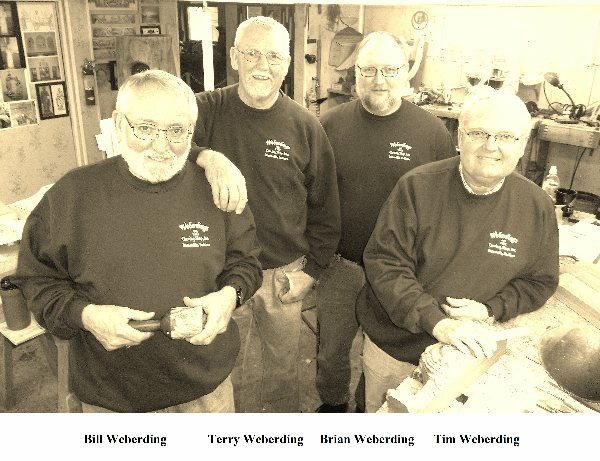 In 2012, Weberding's Carving Shop Celebrated 70 Years of business. 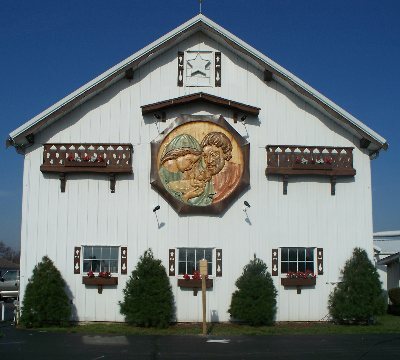 In 2012 Weberding's added this beautiful Medallion as a permanent fixture to be enjoyed year round. It measures 10' in diameter, 4 1/2" thick. Weight is approximately 400 lbs. Hand carved and stained in color. We would like to thank our family members and friends who made this all happen. Please click here to view all the steps involved in creating this carving. Savor Indiana is a program that features communities all around Indiana. The short segments highlight town history, local restaraunts, wineries, breweries, businesses, attractions, shopping oppurtunities, and lodging accomodations. Batesville was just recently the featured town and the program stopped by to film a short segment. Click play below to view our segment and visit www.savorindiana.com to see what other attractions Batesville has to offer when you come visit Weberding's!